Beagles are a good-natured, cheerful and friendly dog! Because they are 'pack-oriented', they are very sociable and like other dogs and people. is home most of the day OR they should have another dog as a companion/friend. OR they should be enrolled in 'Doggy Daycare' 2 or 3 times a week. Also, Beagles should be Indoor Dogs because they love to 'Escape and Roam'. Indoors they are much more affectionate and calm. There are 13" and 15" Beagles. 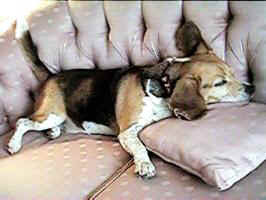 Beagles normally weigh 17 to 28 pounds. Beagles do shed their fur. Intelligent, but require much patience in training. Not territorial with other dogs, but may be protective of food. they require a well-secured fenced in yard and should ALWAYS wear ID tags. Beagles are best kept Inside! Beagles should always be kept on a leash. If you want a dog who will Not run away when off of their leash, do NOT get a Beagle. their basic instinct is to chase. Whether they chase or not, depends a lot on the cat. If the cat is not afraid of dogs and does not run, then many dogs will not chase. Introduction to each other is Very Important. Do Not allow either to scratch or chase the other. Never leave animals alone together unless you are absolutely sure they get along. to Not leave doors or gates open because the Beagle will escape. Also, remember that when outside, a Beagle must ALWAYS be kept on a leash if not in a fenced in area. control their emotions and some (not all) loudly bay (howl) with joy ! This must be accepted and hopefully appreciated by their owner/parent. excellent sense of smell and will be tempted to dig in the garbage for food! Keep all indoor and outdoor garbage containers tightly secured! make an Excellent 'indoor' dog and a not-so-good 'outdoor' dog ! Reason: They like to roam and will dig out and run away. they are very content indoors. Beagles are a good-natured, cheerful and friendly dog. from being enrolled in Doggy Daycare 2 or 3 times a week! for supervised socialization, confidence building, and lots of exercise! at the end of the day not only happier but ready for human companionship and affection. FOOD - If your Beagle scratches a lot, have the vet check him out for skin problems. PurniaOne Sensitive Systems Food OR ProPlans Sensitive Skin & Stomach. These brands of foods are sold at most Petsmart and Petco stores. Beagles are best kept indoors but of course they also enjoy and benefit from being in a secured backyard for short periods of time. An underground electric fence(used with a special collar), often called 'invisible fencing', will probably NOT contain most Beagles. Besides the fact that the dog can leave your property if highly motivated, any person can easily walk on your property and steal your animal!! Another threat is that any larger animal can enter your property and attack your dog! To make your property as secure as possible, you would do best with about a 6 feet high fence which canNot be climbed and you should put 12" x 12" (2" thick) cement stepping stones around the entire inside perimeter of your yard. Remember to keep you gates locked and know and trust your neighbor! urinate more often. Puppies will require a lot of your time for training. but they are usually past the chewing stage and many are already housetrained. Purchase an odor remover, like Nature's Miracle. from any area where puppy is not suppose to go. Block off a section of the house for your pet to use. Regular size 'Swing Open' Doggy Walk-Thru Gate. Doggy Door .... Freedom of choice for your loyal and loving companion! 'Electronic' Doors and even Doggy Doors to use with a 'Sliding Glass' door! Is the Dog for the CHILDREN? The responsibility of having an animal joining your household is similar to having another child in the household. The primary responsibility for the care of the animal belongs to the adults in the household. Animals need a responsible adult to love, teach and care for them, to drive them to vet appointments and to pay for any expenses associated with their care. Therefore ALL family members, not just the children, must want the animal and be committed to give it attention and care. A dog has FEELINGS and should be part of the family and cared for the same!